June 4, 2014 by Design Engineering Staff Stafford collars and couplings line designed for extreme temperature applications. 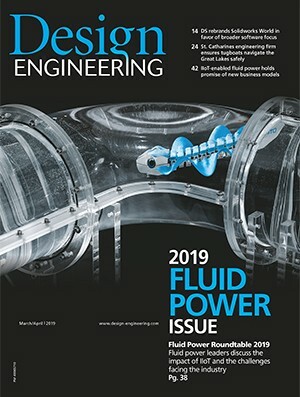 May 29, 2014 by Design Engineering Staff Cambridge-based automation giant sees revenues top $200 million for fiscal year. May 28, 2014 by Design Engineering Staff Harting Ha-VIS eCon unmanaged ethernet switches designed for harsh environments. May 20, 2014 by Design Engineering Staff Baldor Dodge conveyor line expanded to include XT Hubs and Bushings. May 14, 2014 by Design Engineering Staff EPFL researchers develop robot capable of reacting and grasping complex objects in less than five-hundredths of a second. May 13, 2014 by Design Engineering Staff Beckhoff EL7201-0010 servo terminal supports one cable motors. May 13, 2014 by Design Engineering Staff B&R ACOPOS servo drive update detects and corrects following-error automatically. May 8, 2014 by Mike McLeod Industrial products firm stresses innovation to win place on Canada’s Top 100 Employers listing.